"Midnight Curse" was the best Scarlet Bernard novel yet. Scarlet has grown up, come to terms with her power and her position in the Old World and (almost) figured out what she wants.The result is a well-paced Urban Fantasy thriller that is still largely character driven. 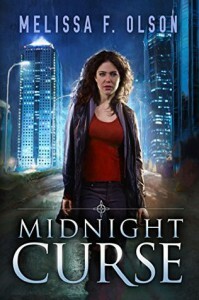 "Midnight Curse" (a title almost as lame as the cover - the only reference in the book that comes close to this is "midnight drain" which I think would have made a better title) takes place three years after "Hunter's Trail" and crosses over with the events and characters in the Boundary Magic series. I liked the fact that things have moved on over the three years since "Hunter's Trail". Scarlet has had a period of relative quiet to grow into her role and her relationship with her werewolf lover, Jesse's world has fallen apart and the LA Old World has settled into a liberal,rhythm of power sharing between vampires, werewolves and witches that it takes for granted. This peaceful rhythm and Scarlet's peace are shattered when Molly, the vampire who was Scarlet's housemate in earlier books, commits an unforgivable crime and reaches out to Scarlet for help. Scarlet steps up and risks everything to protect Molly. This was satisfying to watch Scarlet being a powerful player in her own right rather than a fragile, used to broken but I'm getting better hones, ex-victim. What follows is a clever plot, centred around Molly's back story and the exploitation of women by ruthless men who see them as not quite human. This is combined with a theme about powerful shadowy figures who want to deconstruct the system of laws and trials and powersharing that make the LA Old World special. For a while I was sure that the bad guy was going to turn out to be a supernatural version of Bannon. The inhumanity of the men, who cannot even understand why what they do to the women is wrong, was chilling and very relevant to today's politics. A cross-over with the Boundary Magic series added an edge to the story as well as providing some light relief by showing how Lex, a powerful boundary witch, throws Scarlet completely off her stride. What I enjoyed most in this book was that, in the midst of an increasingly complex supernatural world, the emotions and the relationships were the real focus of attention.